A new, modern hotel situated within the historical aerea of our city. Conceived to suit the requirements of those who seek for confort and quality. Concierge – Multilingual staff, Business Center, Surveillance Cameras, 24 hours security personnel, Laundry & dry cleaning service, Lost & found service, Medical aid, handicapped rooms & facilities, Communicating rooms, Large Breakfast room – offering Buffet service, Coffee Bar/Snack Bar. 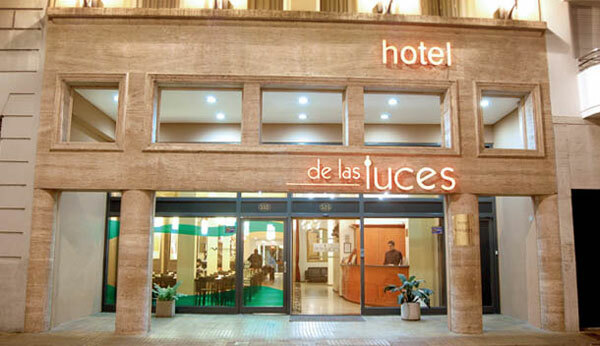 Hotel De Las Luces offers 53 cozy rooms equipped with color TV set with cable channels, DDI & DDN telephone, Double panel windows, Self regulated air conditioning (H-C), Digital safe deposit box, comfortable box springs, Electronic Lock and amenities. Frigobar. Wi Fi Internet in all rooms and public areas. Situated in “La Manzana De Las Luces”, a few steps away from the main tourist attractions and government buildings: Plaza de Mayo, Casa Rosada, Metropolitan Cathedral. Close to the financial district and San Telmo and Puerto Madero neighbourhoods. Only 35 minutes away from Ministro Pisarini – Ezeiza – International Airport and 15 minutes away from Jorge Newbery domestic airport.